Making Medical Lab Quality Relevant: Laboratory Quality: words or rhetoric? Laboratory Quality: words or rhetoric? This month the Infectious Diseases Society of America published a new article (A Guide to Utilization of the Microbiology Laboratory for Diagnosis of Infectious Diseases: 2013 Recommendations by the Infectious Diseases Society of America (IDSA) and the American Society for Microbiology (ASM)) in the journal Clinical Infectious Diseases. It is an impressive document and for those interested in laboratory medicine, and clinical microbiology and laboratory diagnosis to assist infectious diseases, it is an impressive document. It is about 100 pages long and includes 250 references, so it would be fair to call it comprehensive. It was an impressive task to compile all this information and put it together in a single comprehensive manuscript. The authors should be congratulated. Unfortunately, despite all these positives and kudos, it not only misses the bull’s eye, in my opinion it by-and-large misses the whole target. The shame of the matter, is that the authors are all very well know and well respected microbiologists in the clinical laboratory community; and they know what the target is, or at least should be. They say right up front “Physicians need confidence that the results provided by the microbiology laboratory are accurate, significant, and clinically relevant. Anything less is below the community standard of care.” And they are bang-on. I agree entirely. So what is their plan to ensure that laboratory results meet those criteria; their answer is that “all microbiology specimens be properly selected, collected, and transported to optimize analysis and interpretation.” The problem is that this is just far enough off to be misleading and misguided. Don’t get me wrong, I think that collection and transport of clinical samples is important, indeed very important. And if you want a document to help with clinical sample collection and transport, you can consider this manuscript, or better, look at the Canadian Standards Association document “Z316.7-12 - Primary sample collection facilities and medical laboratories - Patient safety and quality of care - Requirements for collecting, transporting, and storing samples”, which I think is eminently readable and applicable. Where we diverge from the value of the IDSA article, is that even if the sample is collected and transported properly, that does not ensure that it will be processed properly or accurately, or that the results reported in the clinical report will be significant or clinically relevant. While it is true that many, indeed most REPORTED laboratory errors are derived from the pre-examination phase and it is also true that testing accuracy and significance are affected by specimen quality, it is also true that testing, interpretation are influenced largely by laboratorian practice and competency as is the ability to generate a clinically relevant report. 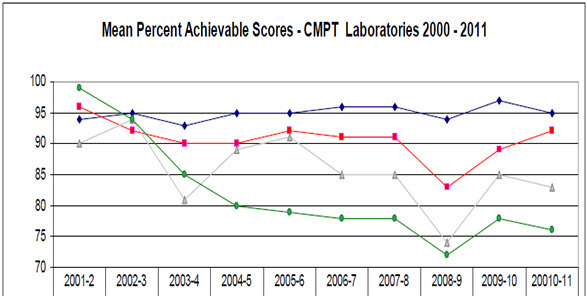 We know that from data generated from our proficiency testing program over the last 10 years. In the table below, you can see performance of advanced laboratories (Blue), intermediate (Red), small (Silver) and very small (Green). It speaks to the mindset of the authors when the word “Accreditation” is found in a 100 page (about 10,000 word) document only once, and this is in a footnote. The word “proficiency” is similarly found only once, and not in the context of proficiency testing. And the word “competency” is not found at all, nor is the phrase “quality management”. If clinicians are going to have the confidence that laboratory results are accurate, clinically relevant, and significant we need to be able to document in a public fashion that we laboratorians take these issues seriously and that we undertake the necessary steps to ensure through qualified external assessment that our leadership and sample management and competence and knowledge and proficiency are active and intact. PS: The October in Vancouver Conference for Medical Laboratory Quality is coming along nicely. Hotel space is filling up well. I suspect we will have more registrations than rooms at the convention rate. Labels: accreditation, accuracy, Clinical relevancy, competency, Laboratory Performance, performance, Pre-examination, Proficiency Testing. The Customer you do not have.